Journal Entry: May 10 9am: What a day yesterday turned out to be! 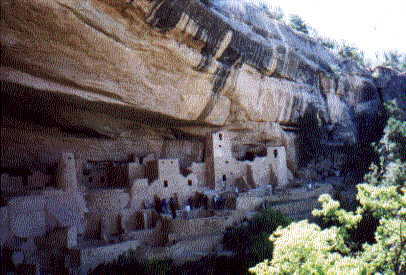 After Durango I went to see Mesa Verde National Park. Went on their 3 hour tour, hiking through the woods and climbing around inside the "cliff dwellings". I've seen so many things on this trip! After, headed to Four Corners (quite a long drive through the desert). Had a "not so flattering" picture of myself taken with each hand and each foot in a different state. Won't include it here. Might even take it out of my photo album. But, what the heck, it was fun doing it, and I'll never be back in Four Corners again. And THEN, instead of sticking to my quasi-preplanned route, I decided to go north. Why? Who knows. Guess I figured I'd find a short cut. Thought I could start at the "beginning" of the Grand Canyon, and work my way down to Page, Arizona. Big mistake. Utah was one of the few states that I didn't have a map for. So I thought I'd just "wing it". It couldn't be that far. Plus, I'd probably see some neat stuff along the way. The little "short cut" started out alright. Ran into a road construction right off the bat. Stop and go traffic in the desert. Then it cleared and it was free sailing after that. Clear, calm skys. But by the time I reached a place called, "Blanding, Utah" the wind was severe! I had never seen such a relentless wind! I saw my first tumbleweed--it had to be the size of a voltswagon! Huge! The clerk in the Blanding gas station saw it first. She said, "Wow, look at that monster! We talked for awhile. She told me that there was a campgroud up the road where I could stay. I should have listened. It had already been a long, long day. But no, I had to push on. I had no idea what was in store for me! I was about to enter "THE CANYONLANDS!" 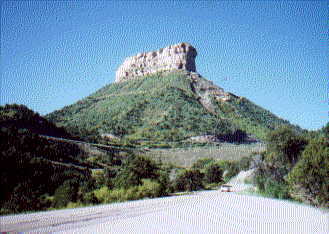 Above: Four Corners: The only place in the US where four states meet. 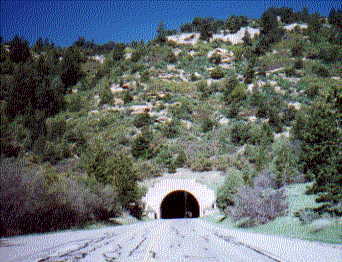 New Mexico, Colorado, Utah, Arizona. 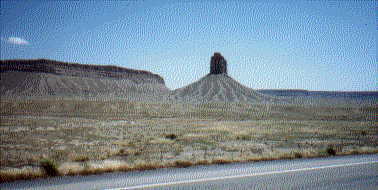 Ok, so here's the story...after visiting Mesa Verde and Four Corners, I decided to drive north. Should have called it quits, and stayed at the campground in Blanding. But it was hot, and windy--very windy, and I didn't feel like setting up camp when I knew I had at least a couple more hours of daylight left. I thought I could make it to some nice campground on Lake Powell. But it didn't work out that way. After leaving Blanding I came across the Natural Bridges National Monument. Stopped in there, got some pictures. All the campsites were taken so I had to move on. It was about 5 pm. Still windy as hell. To make a long story short, once inside Glen Canyon the terrain got progressively more alien (for someone who never been in a canyon). It was breathtaking alright but I didn't realize that I'd be driving along the bottom of a canyon. There was canyon on both sides of the road. It's wall towered way, way above the road. I wanted to stop and take some photos, but there were many road signs warning: "Do Not Stop, Falling Rocks" and "Danger, Falling Rocks". So I didn't stop. Plus, it was so windy, I thought maybe that might increase the possibility of falling rocks. Probably not, guess I was just being super cautious because I was getting kind of tired. There were no rest areas (the road was too narrow anyway), no people (might have seen 2 or 3 cars drive by), it felt like it was just me and the canyon, and the wind. And it was starting to get dark. I had no idea how long it would be before I would find a place to sleep. Now, that I have a map in front of me I can see that I should have taken Rt. 276 off Rt. 95 to get to Lake Powell. Ohhh. I finally came to a place called Hite's Marina right off Rt. 95. It was early evening, just starting to get dark. I thought I'd pull in here andsee if I could find a place t set up my tent. But it was so windy that when I opened my car trunk--some things blew out and I had to chase them over the rocks. Nope, no way the tent would stay up. And even if it did, the noise of the wind would keep me awake all night. There weren't any people around. I noticed the concrete rest rooms and considered putting my cot up in there. Nope. Hite's marina is very small. There's a gas station/small convenience store. The owner was closing the store for the night. I went in and talked to him. He told me that he'd never seen it so windy before in the canyon. I asked for some directions. He told me that I would have to drive all the way back the way I came to find a place to stay. Then he said that he had a camper out back that he could rent to me for the night. It had no water, no electricity, and no toilet--but he'd let me sleep in it for $85.00. Yeah, right! He told me I wouldn't find anyplace cheaper around. The idea of sleeping in some old, unused camper wasn't very appealing. Especially without a light to check it out. Who knows what creeper crawlers might have taken up residence in there. The guy must have thought that there was no way that anyone would go back out there on that winding canyon road at night. I told him, "No thanks, I'll just keep on driving." And I did. 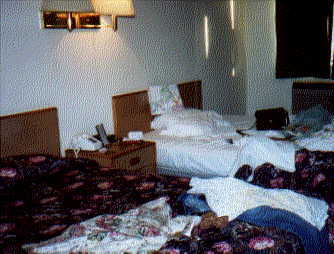 At that point in the trip I had never slept in my car before, so the thought still hadn't occured to me. By then I was so exhausted, I wasn't thinking straight anyway. So back out on the road I went, not knowing how far I would have to drive to find someplace where I could rest. Sure wished I had a map. Finally, slowly ascended from the canyon to a windy plateau where I had to slow down , and sometimes stop, because the blowing sand was so heavy that I couldn't see anything in front of me. Saw an "Open Range" sign. A cow was standing on the side of the road. I was so glad to get out of that canyon! Fifty-six miles from Hite's Marina was Hanksville, Utah. Hurray! Had never heard of the place before, but it sure was heaven to me that night. 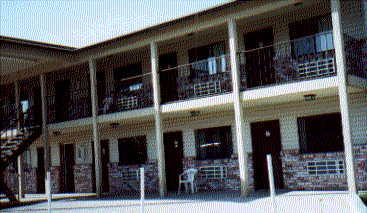 Still too windy for a tent, so I had to get a motel room--$45.00. Sleep at last! And a shower, cable, and a huge bed. Slept like a queen. NOTE: You can tell by the volumn of writing I did on this day that the experience made quite an impression on me. But that's what a "road trip" is all about: expecting the unexpected, taking a few little chances, cramming in all the sights & experiences that you can--while you can! And don't ever worry about getting lost. The way I look at it is, I've never been lost--I just didn't know exactly where I was at the moment. All ya' have to do is keep going and eventually you'll come through to the other side.